Filigree Pieces make Fabulous Holiday Accents! Bright polished non-tarnish aluminum and brass filigree pieces are perfect for every type of project... ornaments, accents for belts and bags, a great backing for vintage finds. Styles in aluminum include square, circular cupped, and sunburst. The traditional brass filigree pieces are heavier and can be soldered. Jewelry, Decor and Ornament Kitz! This tiny wreath, when complete fits on your lapel or can easily be a pendant. Our mini wreath kit is perfect for every one! You add the enclosed pin back or create a hook for hanging. Great office gift! Bow, Angel, Dragonfly? Top your Gift with another Gift!! At last, a memorable (and fun) way to wrap a gift for that special someone!. Its not your standard bow, but part butterfly/dragonfly and part decoration, this "winged" creature sits on your gift box and says "don't throw me out". After its initial use, save it and wear as pin (with included pinback) barrette (use instructions and wire to barrette), or hung as an ornament. This kit is for those who like to experiment, is not too difficult. Kit descriptions use, but do not require the Twist 'n' Curl tool (which can be purchased with this kit). Alternative methods are described for those who already have a wire wrapping tool or something similar. 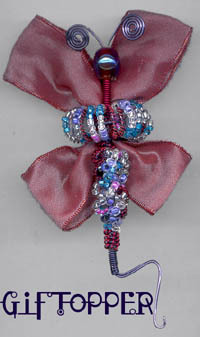 You get shimmering multicolored ribbon, 20 gauge wire, and 24 gauge wire. Comes in assorted colors, please specify "christmas colors" (which uses gold/rust/green ribbon with coordinating beads) or "birthday colors" (which uses mauve/blue/pink ribbon with coordinating beads) Instructions also include ideas on design variations.